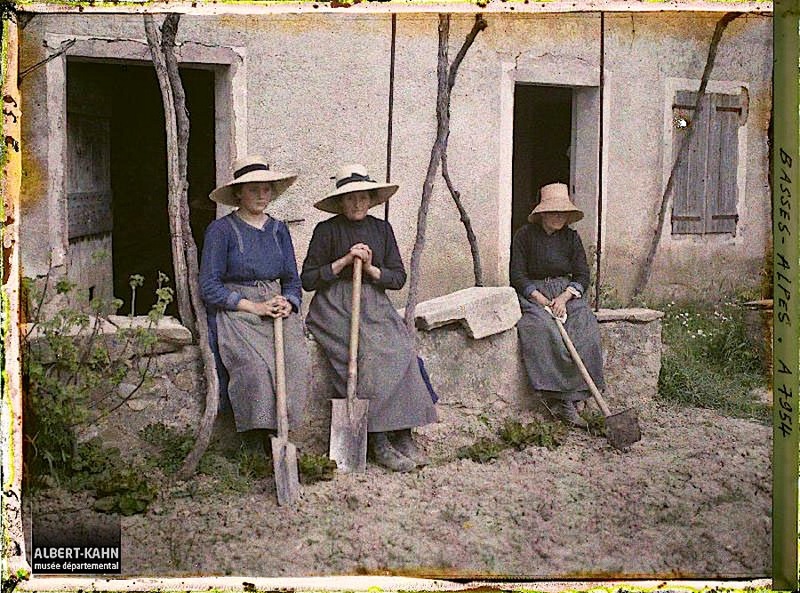 Women resting after working in a garden or vineyard, Les Mées, Basses-Alpes, France, April 13, 1916, by Georges Chevalier, via Archives of the Planet Collection – Albert Kahn Museum /Départment of Hauts-de-Seine. I love their hats. Les Mées is in Haute or upper Provence. The area — very dry and hot — is one of the least densely populated in France. *words of Albert Kahn, 1912. Also, the above photo (A 7 954) is © Collection Archives de la Planète – Musée Albert-Kahn and used under its terms, here. 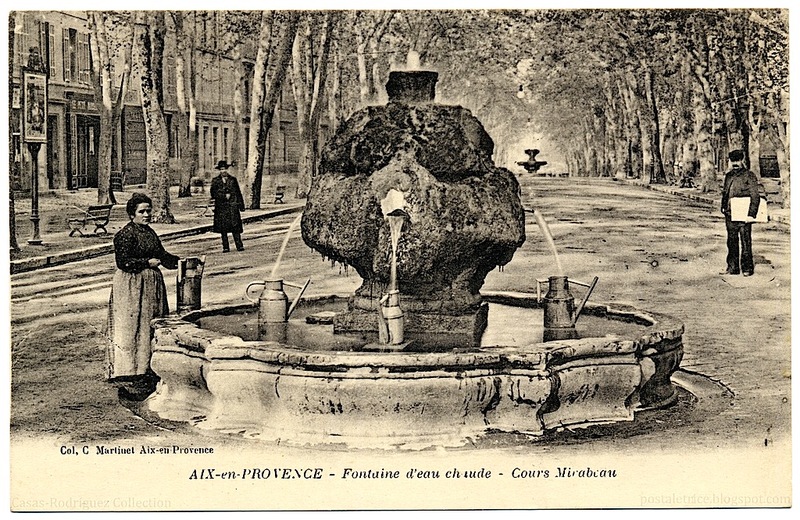 “Hot water in the City of the Thousand Fountains,” Aix-en-Provence, France, ca. 1910, by Guittard (published by C. Martinet), via Casas-Rodríguez Collection, under CC license. The Fontaine d’Eau Chaude was the first fountain built on the Cours Mirabeau — in the 1600s. The hot water (34°C/64°F) comes from the hot springs of Bagniers. There are current photos here and here, showing it still covered in moss. 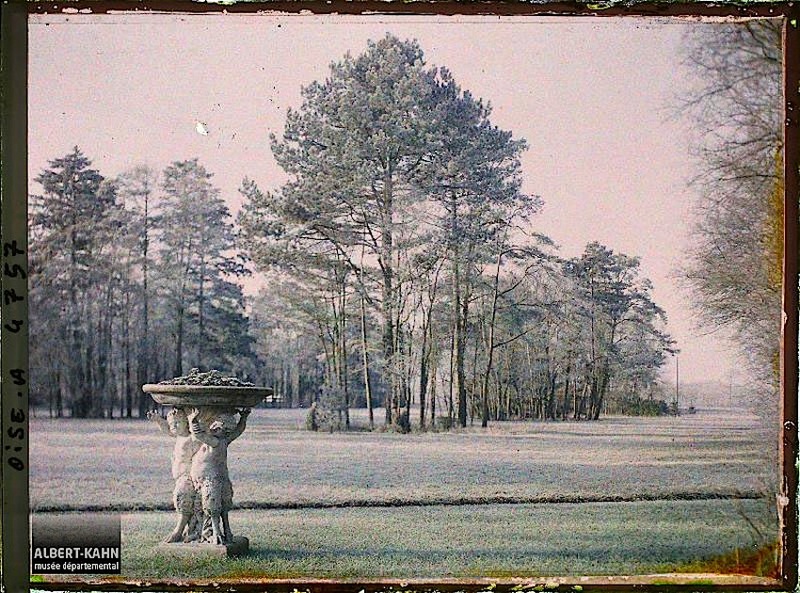 Grounds of the château of Captain René-François Fenwick, Senlis, France, December 26, 1914, by Auguste Léon, via Archives of the Planet Collection – Albert Kahn Museum /Département des Hauts-de-Seine. The house itself had been largely destroyed in a WWI battle about four months before the photo was taken (another image here). Fenwick was a captain of the 31st Regiment of the Dragons who fell in combat in July 1918 (“an example of energy and good humor under fire”). The autochrome above is one of about seventy-two thousand that were commissioned and then archived by Albert Kahn, a wealthy French banker, between 1909 and 1931. Kahn sent thirteen photographers and filmmakers to fifty countries “to fix, once and for all, aspects, practices, and modes of human activity whose fatal disappearance is no longer ‘a matter of time. '”* The resulting collection is called Archives de la Planète and now resides in its own museum at Kahn’s old suburban estate at Boulogne-Billancourt, just west of Paris. Since June 2016, the archive has also been available for viewing online here. *words of Albert Kahn, 1912. 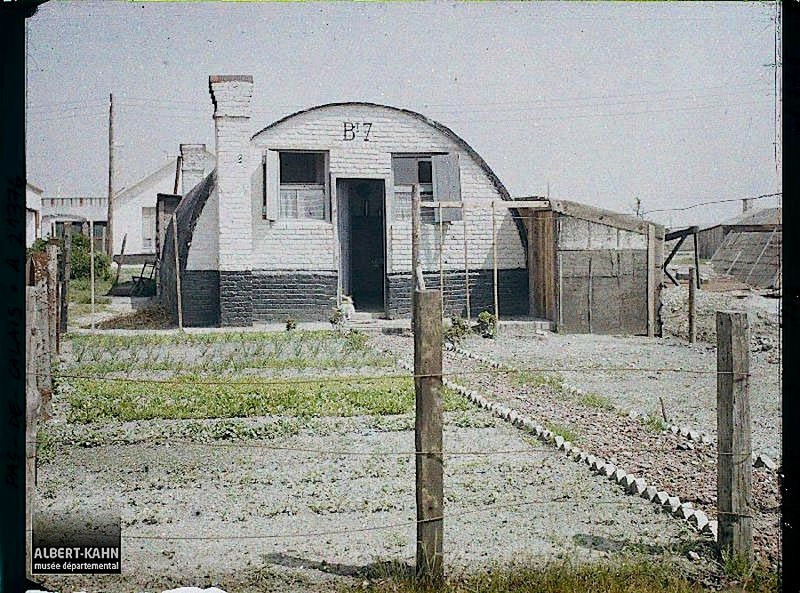 Also, the above photo (A 4 757) is © Collection Archives de la Planète – Musée Albert-Kahn and used under its terms, here. 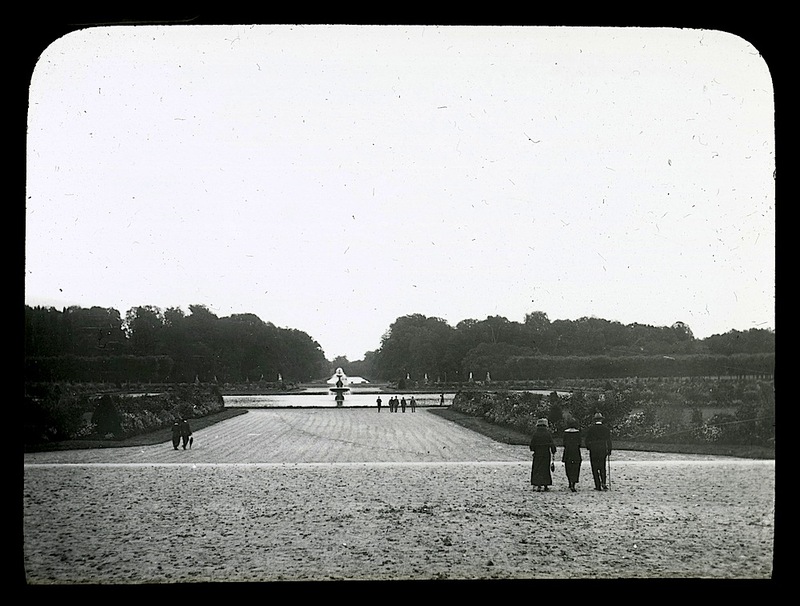 Part of the formal garden of the Château de Fontainebleau, with the Grand Canal barely visible in the distance, Ile-de-France, France, between 1914 and 1925. This is a glass lantern slide by Williams, Brown & Earle, Inc., via Archives of American Gardens, Garden Club of America Collection, Smithsonian Institution (used here by permission). The Archives holds over 60,000 photos and records documenting 6,300 historic and contemporary American gardens. At its core are almost 3,000 hand-colored glass lantern and 35mm slides donated by the Garden Club of America, which is the source of this image. Little house and garden of a coal miner, Lens, France, May 16, 1920, by Frédéric Gadmer, via Archives of the Planet Collection – Albert Kahn Museum /Département des Hauts-de-Seine (all three photos). 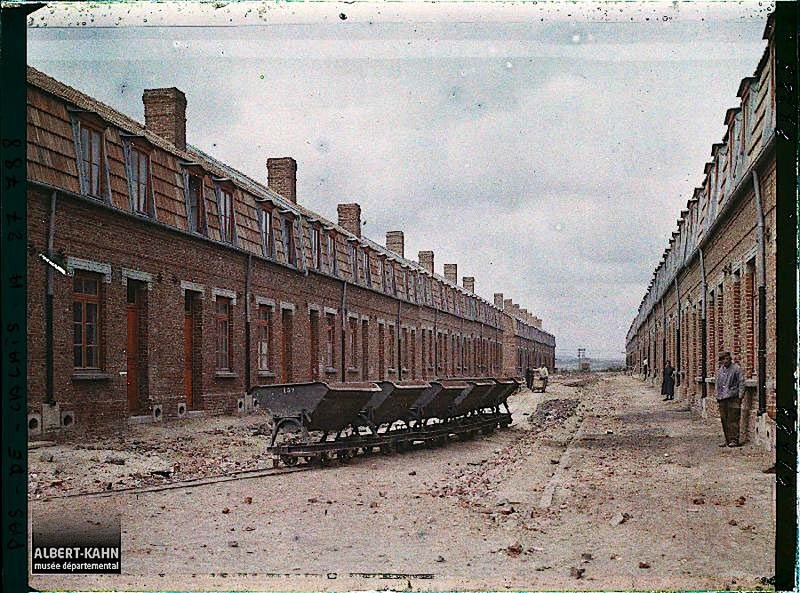 The city of Lens, once home to the Lens Mining Company, was largely destroyed in World War I. 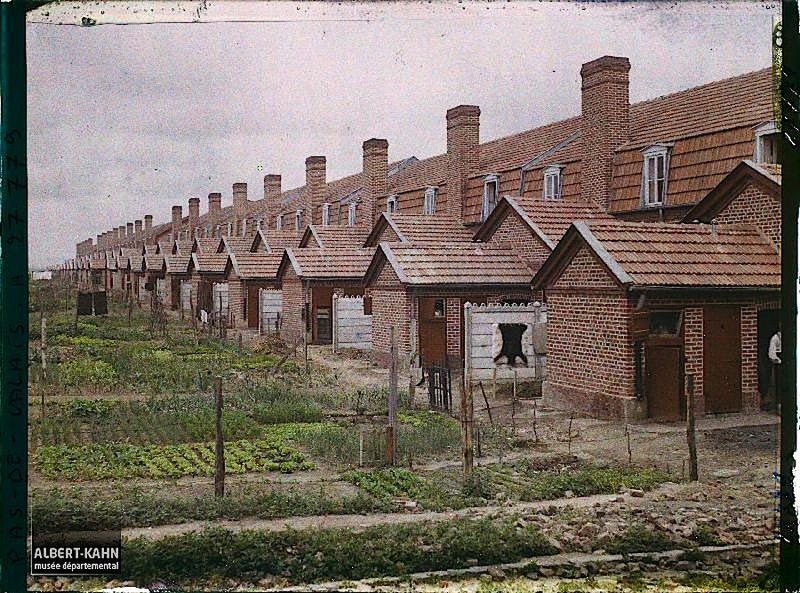 The photo above shows post-war temporary workers’ housing. Avion, just south of Lens, was similarly devastated. The photos above and below show new houses on Rue Pascal on June 14, 1921. The front sides of the new houses on Rue Pascal. Avion was un coron (a mining village) of the Liévin Company, which had 9,695 employees at the start of WWI. You can see these homes today here. These autochromes are three of about seventy-two thousand that were commissioned and then archived by Albert Kahn, a wealthy French banker and pacifist, between 1909 and 1931. Kahn sent thirteen photographers and filmmakers to fifty countries “to fix, once and for all, aspects, practices, and modes of human activity whose fatal disappearance is no longer ‘a matter of time. '”* The resulting collection is called Archives de la Planète and now resides in its own museum at Kahn’s old suburban estate at Boulogne-Billancourt, just west of Paris. Since June 2016, the archive has also been available for viewing online here. *words of Albert Kahn, 1912. Also, the above photos (A 21 376, A 27 779, A 27 788) are © Collection Archives de la Planète – Musée Albert-Kahn and used under its terms, here.